Because we know the Sun so well, we use it and other similar stars as templates to understand the physics of other objects in the universe. Thus the theory and modelling of stellar evolution play a key role on our understanding of the universe: from the habitability of exoplanets to the nature of dark matter, you name it! The problem is that it is extremely complicated and different authors use different treatments, which leads to some inconsistencies, especially for stars that diverge from the solar standard (see part I). With that in mind, let us ask ourselves again, this time with feeling: how much should we trust our understanding of stellar evolution? Stars are sort of like onions (see Fig. 1): they have various concentric layers on the inside and can remotely make a fully-grown human teary-eyed. 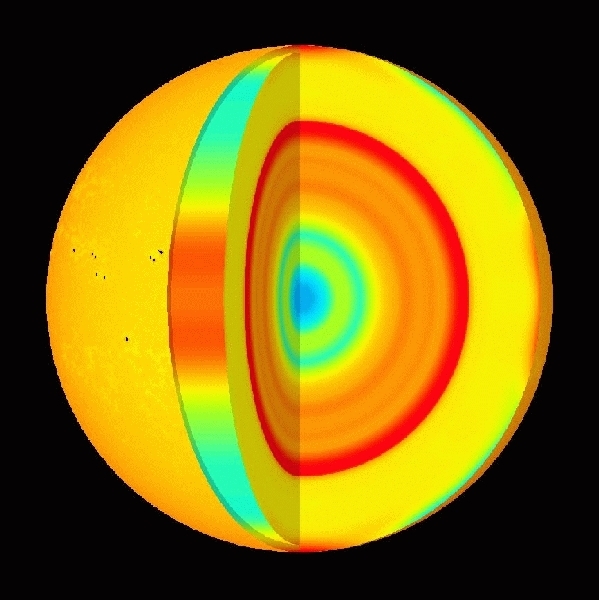 The Sun in particular has three main layers: the core, the radiative zone and the convection zone (Suk Sien Tie’s bite is a great read about this). In part I we briefly saw how convection is usually treated: It is mainly this process that mixes the material inside the Sun, changing the chemical composition in its surface. But, in today’s paper, the authors analyze the effects of another, usually overlooked process that changes the Sun: atomic diffusion. Diffusion happens mostly in the radiative zone of Sun-like stars: it is driven by gradients of pressure, temperature and concentration of chemicals. Even though it was theoretically proposed in the context of stars in 1917, to this date it has not become a standard ingredient in stellar evolution models. Aiming to patch this hole and test how diffusion changes things, the authors employ what I like to call the “cool kid” of stellar evolution codes: MESA (it has previously been featured on this bite, this one and others). Do you recall that I said that stellar ages are the Achilles’ Heel of modern astrophysics? Well, this is where diffusion makes things even trickier (see Meredith’s bite for a summary on how stellar age estimation can be performed). It turns out that atomic diffusion is actually very important: it has the effect of extending the convective mixing into more deep regions, which changes the surface composition even further. This means that if we assume that Sun-like stars keep the same surface composition during most of their lives (which is something that I actually did in my undergrad research project), we would make systematic errors of up to 20% in their ages (see Fig. 2). Figure 2. 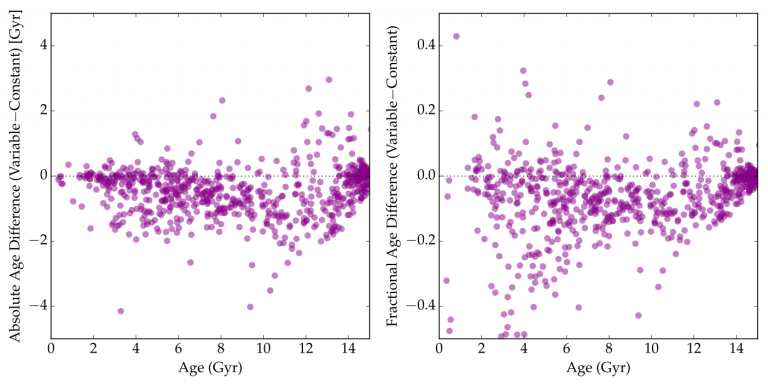 Differences in ages determined from the variable- and constant-metallicity assumptions, in billions of years. The majority of points are negative, which means that the constant metallicity assumption usually overestimate ages. In order to account for this evolution of chemical abundances (i.e., the surface composition), it is necessary to apply what the authors call the variable-metallicity approach to stellar age estimation. This method allows the abundances to evolve from the original bulk composition of the star, reflecting the effects of atomic diffusion. As you can imagine, diffusion also has strong implications for chemical tagging (see Ingrid’s bite). We cannot lump them willy-nilly by their chemical composition anymore — we also have to consider the evolution of the abundances due to diffusion, which makes chemical tagging even more complicated than it already was. But this problem can be mitigated either by working with stars in the same evolutionary phase or focusing on abundance ratios instead of absolute ones (see Fig. 3). With all that said, my hope is that, well, you haven’t lost hope on stellar evolution yet. Of course, the complications can be overwhelming, but it only means that there is still a lot of work to do. Let’s just keep tabs on the assumptions and approximations we make, shall we?